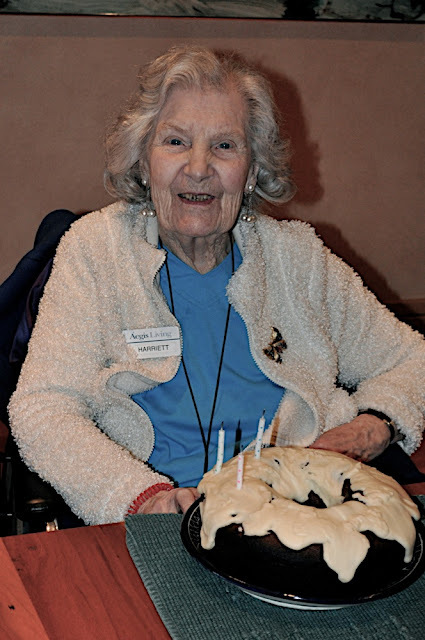 Last week we celebrated my grandma's 93rd birthday. When I told her that she was no spring chicken anymore, she airily responded that just that day she'd lunched with two gals that were 94 and 95, so really, she was the young one. We ran into a bit of a bobble when my dad went to pick up my Grandpa George from his retirement center and grandpa didn't recognize him. He wasn't about to get into a car with some random young stranger. Such is the life of someone with memory loss. Fortunately Uncle Bill was able to convince him that they were, indeed, related, and in fact headed to a birthday party. I'm betting that Bill promised him ice cream. Grandpa will go anywhere if there is ice cream involved. He was serious too. But then again, he didn't believe when I told him that he was 99, either.